First of all this is not mattifying product. BUT it's the one the most lightweight sunscreens around. I spent money to luxury sunscreens from french houses or dermatologist acclaimed brands and their lightweight fluid was a matter of alcohol denat. I am a person with oily skin with greek genes but living in the UK at the moment. Let's face it, oily skin after a couple of hours will be oily again the secret is to be committed to a product that doesn't make you more oily. Also, the most of the mattifying products make the face look un-natural and a moisturizer cannot replace the job or an oil absorbing powder. This sunscreen it's like a veil and the ingredients are outstanding. I am tired of layering tons of products just to make sure I've got the most of the antioxidants. Choose your favourite anti oxidant serum for an even extra boost and this sunscreen and you will be pleased. Also, skin needs some kind of training, retinol and niancidamide or vitamin c can make skin more sensitive or drying. Well formulated products can really help those ingredients. So(!) Anti aging along with SPF and light fluid? Not easily found out there and I think Paula Begoun knows it already with the making of excellent ingredient products. The fluid is really lightweight but whitin an hour my face looks so greasy like putting highlighters all over it. I really wanted to like this because I really like the ingredients but it’s a big no how it looks over my skin. The three stars are for the ingredients. Really disappointed in terms of how they advertise it. Customer Carea: Thank you for sharing your experience with us - we're sorry to hear this didn't work as expected for you! Please contact a member of our Customer Care team, who can assist you with a possible alternative. This is probably the only SPF moisturiser on the market that doesn't break me out. It is PERFECT for a holiday when you need that extra protection from the sun. It can be a bit drying and can sting when I apply it, so I tend to use it only when I know I will be out and about in the sun for more than 30 minutes. I wouldn't recommend using it daily though. Worst Paula’s choice product I have used. 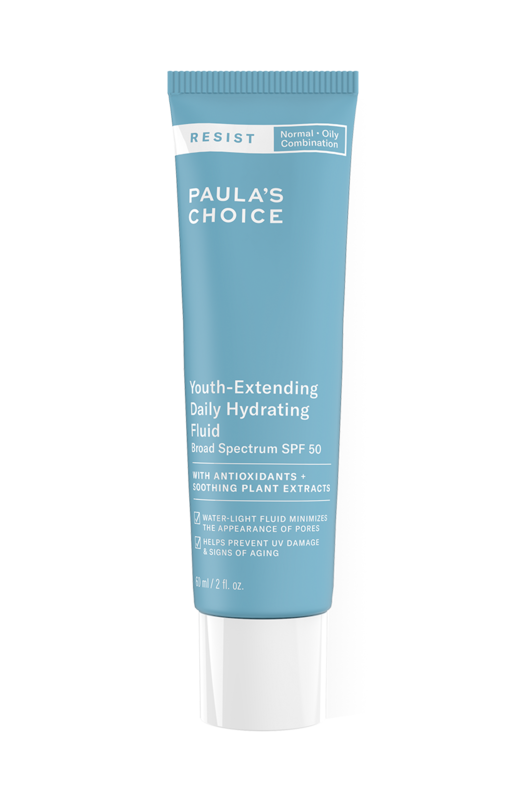 In the husle of planning for my annual beach holiday I forgot to order my Paula’s choice Resist superlight spf 30 so I thought, since I live in London, there must be a shop that has my fav brand. Where surprise surprise only Selfridges had some products(not all). I did my research before so I knew this product will not mattify as superlight does but I chose to trust Paulas’s choicr products as I use them for years now. Also, description of the product says it goes for oily and combination skin too, which got me thinking it can’t be that bad and I will work out the shinning surfaces if any. Even the Selfridges beauty adviser explained this is way better for the summer period than Resist superlight(maybe because they didn’t sell it there, but I thought about this later, I just trusted her). Oh well, Resist Youth extending spf 50 is a white paste that applied on the skin makes it glow a bit to much which is not the best for a combination skin during summer but I thought my foundation and a bit of pounder will sort it. The worst part was when after I applied my foundation, the white paste started to form small white particles which made my entire face looked like I have dry, chapped skin and the foundation was creasing with joy everywhere! As a plus, they didn’t had the product in sample size so I had to buy the whole cream. If I could I would ask for a refund! Customer Care: Hi Alexis, we are sorry to hear about your experience using this product. We will contact you personally about this. This is an amazing product. All other moisturisers just made my oily skin worse and my foundation just slid off after a couple of hours. This one creates a lovely base for foundation, super light, leaves a matt finishes and foundation just glides over. Also my make up is still in place at the end of the day. I can hardly believe how good this is. The search is over. This is my skincare staple - I'm in my 40s and like to wear a product with a high spf every day. I also have oily skin that is prone to small breakouts and other spf products I've tried have felt greasy on my skin. This doesn't feel greasy at all, it has quite a runny, milky texture which absorbs really well into my skin. It doesn't make the skin matte but it doesn't make it more greasy, I sometimes add a mineral powder over the top before applying eye makeup. The only reason I haven't given this 5 stars is that I use it every day so it is quite expensive compared to some other brands - but it works and there's no animal testing so I'm probably a lifelong user of this product! I don't generally like putting SPF on my face - they're usually heavy and greasy. But I tried samples of this a few times last summer while on sunny vacations, and I absolutely loved it. It protected my skin and provided a good amount of moisture. My sensitive skin was not irritated at all. My makeup went on just fine after application, and I felt like my skin had a nice dewy (but not greasy) look to it. Definitely plan on getting a full bottle for this summer! I've using this moisturiser for a while and I've yet find another that works as well for me. For such a high SPF this is very lightweight on the skin and is non-greasy. It blends into the skin well without leaving grey/white cast (I am black with medium dark skin tone) works very well under makeup. whilst it's not greasy, it's also not a matt finish -you could get round this with a matt primer though if you're on the far end of the oily spectrum. This is my go-to spf from Paula's Choice. I have combination skin, and it works great for using all over my face, neck, etc. I love the consistency, and find it goes on great underneath my makeup. 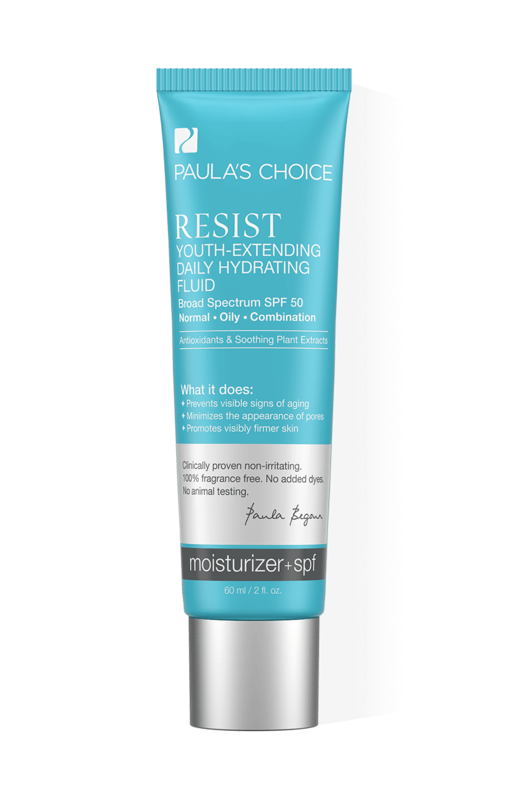 I've used nearly all Paula's Choice spf moisturisers, but this is my favourite because of the high spf, lightweight feel on the skin, and the fact it 'balances' out my skin types. Unfortunately this does not suit me at all. After application my face looks greasy and coarse and feels sticky and uncomfortable. This happens even with a tiny amount of product. It also stings around my eyes. I have persisted for a week but will now stop using it. Pity, as the other two products that I bought at the same time are pleasant to use and seem to be helping my skin. I love this SPF as it's light and non-greasy and goes on easily on top of other products/serums. Probably not for those with very dry skin! I just tried it and will not try it for the 2nd time! After applying it, I could not wait to get it off my face, I just could not stand the unpleasant smell. I generally use fragrance-free stuff on my face, but while this does not appear to have fragrance, it does have a smell and it's just...somewhat bleah. I cannot say anything about its effectiveness, but people with fragrance/smell issues, do be careful. Customer Care: Thank you for your review. We're sorry to hear of your experience with this product. All of our products are 100% fragrance free. What your wife smells is the scent of one or more of the ingredients (raw materials) used for the production of this product. This smell can vary from batch to batch. Of course this smell can be interpreted differently from one customer to the next based on their sensitivity level. Please contact our customer care team for an alternative product recommendation. i am on to my second bottle of this spf now. lasts forever! takes a while to get used to how watery the consistency is but this is a must for acne-prone sufferers like myself so i don't mind. it just means you have to be careful not to squeeze too much and waste it. It doesn't break me out nor does it "gunk" up like some moisturizers can when you apply make up. leaves a nice fresh base for foundation. i just make sure i always leave a few minutes after applying my BHA or BHA moisturizer before i apply this and then also before i apply make up. I feel good knowing i am protecting my skin every day from sun damage. Amanda - Nope, not for me! Bought the trial size, or rather two of them, as the full size was out of stock, it still is which makes me wonder if it's getting the chop? I had trialled the Resist SPF25 and found it too greasy, especially around my nose, so trialled this and didn't like this either. It's not moisturising enough but if I add in a serum, I become too oily in my T-zone. I wonder if the SPF is the problem because it certainly causes my eyes to puff up. Overall, I don't like this, it's one of the few PC products I actively dislike and I now only use PC skincare. Yes, I have emailed CS! These two trial sizes languish at the bottom of my PC products bag, where they belong. Customer Care: We are sorry to hear of your experience when using this product. Although this is not a common response, we do understand that each customer is uniquely different in how they will respond to products or ingredients. We are happy to see that our customer care team has already contacted you to recommend an alternative solution. I never review products but this was so bad that I couldn't hold back.I'm acne prone and this product broke me out all over within hours of being applied,and worse by the next day.It totally set me back in my quest for clear skin,had to abandon my daily skin care regimen and fight the spots with an active benzoyl peroxide product. I love this moisturiser! Over the years I have tried many, many different moisturisers rarely buying the same product twice but this product is my holy grail. Very light in texture and leaves a pleasant silky sheen on my skin. Perfect and just placed my third order! Hands down the best high production face lotion I've tried so far (and I've tried too many to count, some of these ridiculously expensive). Its moisturising, although it doesn't leave the skin matte (which would be too much to want from SPF50 anyway), it sinks into skin quickly, leaves no white film, has very nice gently dewy moisturising effect on normal skin, yet makes a good make-up base. It is very liquid though, so beware when using the tube. If you are looking for an SPF50 which is matifying, this is it. It is so light, non-greasy and goes on like a dream. Leaves skin feeling and looking powdery soft. It is a little too light for winter (but why would I need SPF50 in winter) but it is perfect for summer or a winter-sun holiday. Best SPF50 moisturizer I have ever tried (and I have tried a few!). I was introduced to Paula's choice by a youtuber that I follow. I was very skeptical about trying this product as I am dark skin and all of the face creams I have tried make me look blue or really greasy; this on the other hand doesn't make me look blue but I have to say for my skin type I wish it was a tad more mattifying. I would definitely repurchase and I would definitely recommend this product. The Rolls Royce of SPF moisturisers. Leaves no white sheen or oily film. Perfect for summer. A really good SPF 50 for the face, doesn't clog pores. It does need to be combined with another moisturiser if you have dry skin or are peeling from acid treatments. Dawny - My first ever SPF moisturiser! Love it! This product is the 50 SPF version of the clear daily mattifying fluid. Both are incredibly light in texture, don't break me out, are satisfying to use and being Paula's choice, are reliably full of beneficial ingredients. I would use this one in summer and the clear 30 SPF version in winter. I bought a couple of samples as it's quite pricey for the full size and I wasn't sure if I was going to like it. It's lovely and lightweight, goes on smoothly and sinks in very nicely. Gives enough moisture but not at all greasy. Its not completely matte but isn't shiny either. Great under makeup and I personally had no problems with using it close to my eyes, didn't break me out either!! Will be purchasing the full size. I have oily skin and got on great with it and my makeup lasted a decent amount of time. I would recommend purchasing a few samples first so you don't waste your hard earned pennies. The product is very light, fluid and easy to apply also it does not dry the skin which is amazing. The problem is that it is very shinny not mat at all no wonder how little you apply and even if you have only this on the skin it is shiny. Also it stings if you apply in the eye area. Paula says that her products can be used around the eye area. I am yet to find any of her sun creams that you can apply around the eye area that is ok. I tried also the physical ones and the same happen when it comes to the eye area.